Almost one year after being announced Blade Strangers is released today! 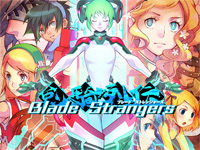 Blade Strangers is a 2D fighting game developed by Studio Saizensen, it is available on Sega's ALL?Net P-ras MULTI. In this game, players can choose between 14 characters including 12 from many different Japanese games: Solange, Master T Drakkhen, Ali and Liongate (Code of Princess), Curly Brace and Quote (Cave Story+), Umihara Kawase, Emiko and Noko Yokoyama (Umihara Kawase), Shovel Knight (Shovel Knight), Gunvolt (Azure Striker Gunvolt) and Isaac (The Binding of Isaac: Afterbirth †). Helen and Lina are two original characters. There are 3 types of characters: short, medium and long range. A home version published by Nicalis for Switch, PS4 and PC is available since late 2017. 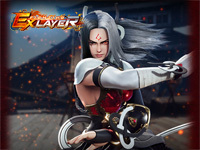 Arika's fighting game available on PS4 in June will be released on FIGHTING EX LAYER is played in a 2.5D environment and battles take place in closed arenas. The gameplay retains many of the mechanics from the first FIGHTING EX out in 1998 and Street Fighter EX series, such as Super Cancels and running. You can watch the PS4 trailer here. 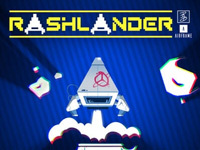 Rashlander is available now! Developed by Ryan Davis, the second game to grace the Airframe platform is a hectic mix of Lunar Lander and Asteroids... on steroids! In this game, the player is a researcher who has to pilot a tiny spaceship through space without crashing or running out of fuel. During his journey, he has to land on small platforms located on asteroids floating in a hostile environment full of dangers in order to refuel, gain bonuses and why not, discover new technologies. Of course, he must successfully avoid attraction fields, enemy ships and other obstacles to succeed so the the task is not easy by any mean. There are 5 levels to go through and many secrets to discover. Controls are limited to left and right rotations and a thrust button. Oldschool isn't it? But the rest of the game is modern in its presentation (in the neo-retro genre) with many video effects, explosions and a great electronic musical score by Fat Bard. Check the trailer to watch the game in action. As you guessed, it's a solo adventure but the developer already announced that the sequel will have 2-player support (Rashlander will be a trilogy). Location test reactions have been very positive which is encouraging! As a reminder, the Airframe system is designed for JAMMA cabinets equipped with a 15khz monitor. As for pricing options, there are plenty. If you already own the Airframe system, all you need is the Software kit which include the game on a USB flash drive, an A4 poster and an instruction strip, this one sells for $599.99. If you don't already have it (or want to keep your Skycurser machine running), you can also buy the Pro kit which includes an Airframe unit for $899.99. If you want to give a makeover to an existing US or Euro style cabinet, you'll need the deluxe conversion kit that includes all artwork needed including a marquee and big decals. This will cost you $1199.99. Finally, you can buy the full dedicated machine equipped with a 19" LCD monitor for $3499.99. You may place you order at Griffin Aerotech website. One year after being announced by TYPE-MOON and Sega, Fate/Grand Order Arcade is finally out ! 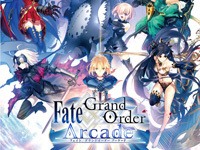 Fate/Grand Order Arcade is based on the smartphone title Fate/ Grand Order (iOS / Android and is developed by Delightworks and Sega Interactive. The game is described as a "Summoning team battle" game. Players summon 3D version of Servants from the mobile game by loading physical cards (Saint Graphs) illustrated by various artists. The cabinet distributes randomly physical holographic cards and there are 20 servants from 8 different class available at the game start. Saber, (Artoria Pendragon, Siegfried, Gaius Julius Caesar), Shielder (Mashu Kyrielight), Archer (EMIYA, Atalanta), Lancer (Elizabeth Bathory, Leonidas), Rider (Saint Martha, Medusa, Georgios), Caster (Cu Chulainn, Wolfgang Amadeus Mozart), Assassin (Carmilla, Phantom of the Opera, Mata Hari) and Berserker (Vlad III, Heracles, Kiyohime, Caligula). Each servant has 2 evolutions changing its appearance. There are 2 main game modes : Grail Wars, an online 3vs3 mode here the players must defeat the opponent team by filling to MAX the « defeat gauge ». And Grand Order, a single player mode where the player access different stages, missions and quests. The game controls are simple, a joystick to move equipped with 2 buttons to target and dash, a button to attack and a button to launch the servant’s Noble Phantasm. Players get GP (the game money) when they win a battle. Those GP can be used to level up the servants, buy items,… The famous singer Maaya Sakamoto performs the game theme song. A Commemoration Login Bonus campaign starts today and will end on August 2. 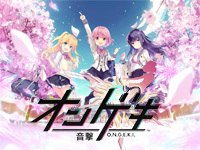 Ongeki, the new musical game from the team behind maimai and CHUNITHM will be out tomorrow. Ongeki features an original gameplay based on a lever and 3 buttons. Notes are coming from the top of the screen and the player must hit the corresponding button at the right moment. There are short and long notes. The game originality comes from the lever: it's used to move on the right and on the left the character on the bottom of the screen to avoid the enemies red bullets and to collect the yellow bells to get life. The player can use up to 3 characters at the same time but only the central character can get the bells. After each game, the player win points and according to the points, he can get virtual card of the characters. Thanks to the Card Maker, he can print real cards. A normal card costs 100 Yens, a shiny card costs 200 Yens and a holographic card costs 300 Yen. Those cards can be used in the game via a card slot to boost the characters in the game. There are 9 characters (only girls) available at the game start. The music selection already includes many titles from anime, POP, Variety, niconico and other genres. Ongeki opening movie is made by JC Staff. A collaboration with the Girls Band Party mobile game starts on the same day: 5 characters from Girls Band Party will be playable in Ongeki. 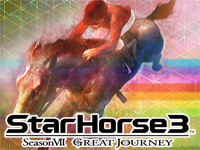 StarHorse3 Season VII - Great Journey, the popular horse racing medal game from Sega, starts operation in Japan today. In this new version, a special JP Challenge "Million Stakes" race named "Amazon Race" is held in South America for the first time. The popular "rental horse owner" funcionality in StarHorse 2 is reintroduced in a renewed version with new rules and renumeration. 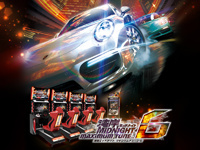 Wangan Midnight Maximum Tune 6 is out in Japan today! This new episode in the street racing game saga adds Porsche cars to an already large selection of vehicles; the 911 Turbo 3.6 (964), two 911 Turbo S?991 MA 171 and 930), the 718 Cayman S (982 H 2) and the 928 GT are now available for your driving pleasure. Other new cars include the Mazda Roadster RF RS (ND), the 1981 Nissan Fairlady 280Z-T (HGS130) and the Nissan Leopard 3.0 Ultima (F31). Lots of new dress-up parts have been added to match the current trends including new aero parts and neon tubes. BBS rims are now available as well as new models from the already present manufacturers (Rays, Yokohama, Enkei). You can now personalize your window stickers and use any text you want (use the team name for example). The 100 stage story mode from Wangan Midnight Maximum Tune 3DX+ is back (that's 40 more chapters than Wangan Midnight Maximum Tune 5DX+). Another new feature is the multiple ghost battle; as a solo player, you can race against up to 3 ghosts simultaneously. Ghosts are smarter too as they now avoid traffic. As with each new version, the maximum horsepower has been increased from 830 to 840HP. The level limit is extended too: it now goes up to SSSSS. You can import your cars and rank from Wangan Maximum Tune 5DX Plus but not from older versions. You can now store 200 cars (instead of 100) in your Banapassport account. The game also features 25 new tunes by Yuzo Koshiro. Talking about the soundtrack, the Wangan Midnight Maximum Tune 5 original soundtrack CD was released recently. This 2-CD album includes BGM from all versions of the game (5, 5DX and 5DX+). Wangan Midnight Maximum Tune 6 signs the departure of game producer Kazuhiro Maeda (who succeeded to Kei Kobayashi from Wangan Maximum Tune 3DX+ on). He's replaced with Mr. Yakata. With the departure of Kazuhiro Maeda and programmer Yoshikazu Takenaka, there's nobody left from the original team who worked on the first Maximum Tune 14 years ago. It's the start of a new era. If you're in Japan, you can use the dedicated search engine to find where to play Wangan Midnight Maximum Tune 6 or use the Wangan Navigator app available for free on App Store and Google Play. Regarding the return of the Wangan Midnight racing games in Europe (as we're often asked about it), the problem comes from the various manufacturer licences that are too difficult to obtain for an arcade game intended to be released in so many different countries. Konami will release Bishi Bashi Channel tomorrow! Bishibashi is a well-known game series including various funny mini games. The first game, Bishi Bashi Champ was released in 1996 and the latest, The?BishiBashi, in 2009. As in the previous work, the gameplay is based on the simple operation "hit a button". But, a new action "turning a button" (used on a great white button) is added to make the game deeper and there are only a red and a blue button as normal buttons. 4 players can enjoy the game on the same cabinet and a 2 team play is available. Furthermore, Konami thought to overseas customers with the implementation of a multi-language system. Customers can switch between Japanese, English, Korean and Chinese when they want. The new version of Sega's musical game is out in Japan today. 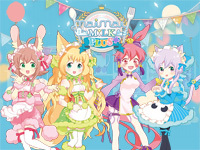 maimai MiLK PLUS adds a lot of new songs and the survival course has been renewed dramatically. Collaboration events also start with the anime Pop Team Epic and CHUNITHM STAR PLUS. Halo is coming to arcades soon! Raw Thrills and Play Mechanix teamed up with 343 Industries to create a massive environmental cabinet equipped with 4 turrets and two 65" 4K screens placed side-by-side. In this cooperative sci-fi shooting game, the 4 players enroll in the Fireteam Raven, a group of elite Orbital Drop Shock Troopers on the surface of Alpha Halo fighting alongside the Master Chief and the rest of the UNSC as they try to prevent the alien Covenant alliance from taking control of an ancient superweapon. Players will have to fight the Covenant troops, spacecraft and vehicles and encounter the "Flood" infestation. Available in Dave & Buster's across the USA and Canada this Summer, Halo: Fireteam Raven will then be released worldwide. Players will be able to scan a QRC code and share their performance on Halo Waypoint portal. 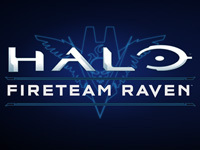 Given Play Mechanix's experience in the creation of succesful shooting games, we can bet that Halo: Fireteam Raven will be a wonderful game! You can see what the game looks like on this video. The cabinet shown in the video is still a prototype, the final version may differ a bit.